The Little Wonder Pro Edger maintains its edging performance even in the toughest conditions. 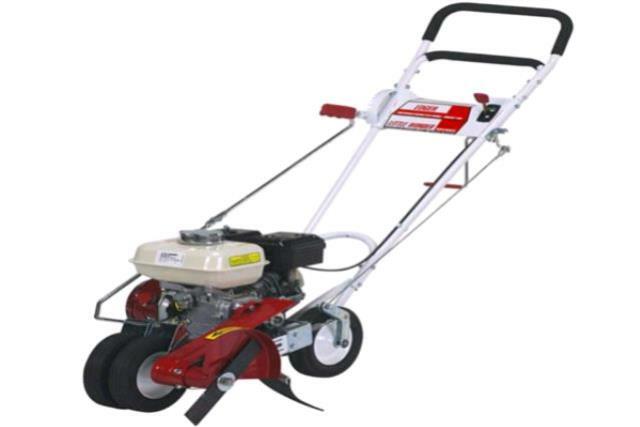 This wheeled edger is designed to cut clean, crisp edges quickly and efficiently. It will cut up to 90 feet per minute! Dual belts provide extra power to the blade. The Pro Edger is user friendly with fingertip controls and a ratchet arm height adjustment system for fatigue free operation and control. The Little Wonder Pro Edger is built for heavy, daily usage. Cut create crisp, distinct edges faster, and with less effort. GX120 Honda engine featuring better fuel economy and rated for up to 2000 hours. 10" steel blade is sharpened on all four sides giving you the ability to flip the blade over and extends time between sharpening. Adjust cutting depth up to 4". * Please call us for any questions on our lawn edger in Concord, serving all of New Hampshire, including Manchester, Canterbury, Loudon, Hillsboro, and Northwood.